If a picture is worth a thousand words, the more than 600 pages are worth 700,000 words of praise. Collector’s photos, memories, and breeder insights adorn this work like crown jewels in the dreams of every dog fancier. Only Bo Bengtson, international judge and top breeder, could have conceived a reference work as exciting as a novel and only Kennel Club Books could have given it life. The book was being written during the highly publicized search for Vivi, the Whippet that escaped from JFK airport after the Westminster Dog Show. Bengtson bred and co-owned that little dog so it was a very painful time for him. 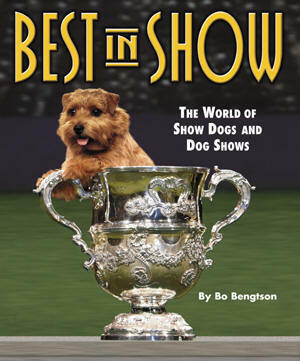 Sub-titled "The World of Show Dogs and Dog Shows", is Bo’s labor of love.